PLEASE CONTACT US IF YOU HAVE ANY QUESTIONS ABOUT YOUR NEW PUPPY OR THE RIGHT PUPPY FOR YOU. Congratulations you have decided to add a Thai Ridgeback Dog to your home, now you must decide if you want a male or female, show dog or pet. Females are usually calmer and quieter. One must know that twice a year they come into heat. Males can be more hyper and aggressive. This is avoided with proper training and socialization from the day you take your puppy home. Spaying or neutering will also help to avoid these problems. 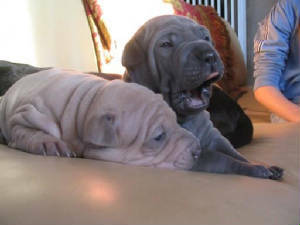 Puppies must reach a certain stage in development before being placed in a home. They must be completely weaned and properly socialized. The ideal age to bring your new puppy home is 8-10 weeks. Purebred dogs have official names that indicate parentage and breeder. Urban Legends Kennel will give your dog its registered name however you may use whatever call name you like. Two syllable or short and sharp names are easier for the dog to understand. Click here for Dog Name ideas. From day one there are rules your new family member must follow whether it is a puppy or an adult. Upon arrival to your home allow the dog to explore to familiarize itself with its surroundings. This will usually take a couple of days before they are completely comfortable. Puppies need their own sleeping area. A basket, or crate with a blanket or specialty pet bed are excellent ideas. If you do not want your dog on your bed or sofa do not allow it from the beginning. An 8-10 week old puppy needs a lot of sleep. They should not be disturbed or picked up while sleeping. Some vaccinations are mandatory in some areas. Contact your vet for information. Vaccinations help prevent contagious and sometimes fatal diseases. Urban Legends Kennels begins all vaccination schedules at 8 weeks of age. You will then be responsible for the remaining vaccinations. These are due at 12 weeks then again at 15 weeks. Yearly vaccinations are required to keep your dog disease free and to maintain validity of your purchase contract. Your vet can advise you of the best vaccination program for your dog. Show dogs and those who travel with us may require additional boosters. Stomach or intestinal parasites can be transmitted in the mother's womb, through direct contact with an infected animal or by eating a parasitized substance. Parasites can cause diarrhea, vomiting or developmental delays. A stool examination performed by your veterinarian can detect parasites and quickly remedy the situation. When you pick up your puppy it will have recieved its first deworming for internal parasites. Your vet will do another for you when you go for the second set of vaccinations. Your vet can advise you of an appropriate deworming timetable. Fleas and ticks are visible to the naked eye, while mites can be detected through a microscope. Fleas reproduce in the animal's environment. If your dog has fleas, don't just treat him - treat all animals in the house and the surrounding environment. There are a number of dips, sprays, or shampoos to use for treatment against fleas. To remove a tick, grasp it near the dog's skin with tweezers. Apply gentle traction to remove the entire head and mouth parts. Do not twist. Be careful not to puncture or crush the body to avoid infecting yourself. In addition, check your dog's environment and treat accordingly. Ear mites, tiny parasites that live on the surface of the skin lining in the ear canal. They pierce the skin surface to feed, causing inflammation and discomfort. If left untreated, bacterial infections and loss of hearing may result.There are several products ont he market for external parasite control. Contact your vet for more information on specific products. All puppies must be fed the proper diet for their specific needs. 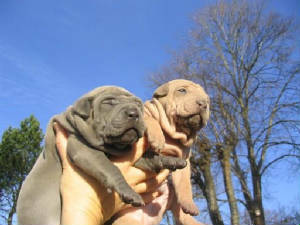 The Thai ridgeback is considered a medium breed dog. The length of the growing period for this group of dogs is up to 12 months of age. 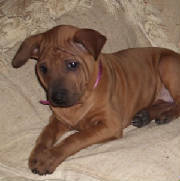 Thai Ridgeback puppies will increase their birth weight by 40-60 times. It is crucial that during this time they require a high intake of energy and nutrients as well as balanced amounts of calcium and phosphorus for good bone mineralization and harmonious growth. It is also important to choose a highly digestible food as the digestive system is at its most sensitive. Water is also essential to your pet. Clean, cool water must always be accessible. To satisfy your dogs nutritional requirement you can choose from several types of foods, dry or canned manufactured foods, or foods that you make at home.Good quality manufactured dog foods are complete, balanced and contain all of the nutrients that your puppy will require during its growth period and during its adult life. Urban Legends Kennel recommends a high quality kibble mixed with water. Canned food may be added as well for extra palatability. Use caution when feeding to ensure your puppy is neither over fed nor underfed. Follow the directions on the bag and dont feed table scraps. It is important not to encourage the feeding of table scraps as many human foods can be toxic to dogs. Solanum lyopersicum (" tomato plant"), not the fruits!!! The symptoms of the intoxications range from very mild (like an irritation of the mucosa of the mouth caused by ingesting chestnuts) to severe (deadly) (like convulsions caused by eating tomato leaves, or heart problems when having eaten taxus needles) depending on the plants. Always use pesticides in accordance with label instructions. Keep pets away from treated areas for the label recommended amount of time. Store unused products in areas that will always be inaccessible to pets. Be aware that fly baits containing methomyl and slug and snail baits containing metaldehyde are particularly dangerous. Rat and mouse bait - place these products in areas that are inaccessible to your companion animals. Christmas tree water may contain fertilizers, which, if ingested, can upset the stomach. Stagnant tree water can be breeding grounds for bacteria, which can also lead to vomiting, nausea, and diarrhea, if ingested. Electrical cords - Avoid animal exposure to electrical cords. If they are chewed they could electrocute your pet. Cover up or hide electrical cords and never let your pet chew on them. Ribbons or tinsel can become lodged in the intestines and cause intestinal obstruction. This is a very common situation for kittens! Glass ornaments can cause internal laceration when ingested. Keep all prescriptions and over-the-counter drugs out of the reach of your pets, preferably in closed cabinets. Remind guests to store their medications safely as well. Pain killers, cold medicines, anti-cancer drugs, antidepressants, vitamins, and diet pills are common examples of human medication that could be potentially lethal even in small dosages. One regular-strength ibuprofen tablet (200mg) can cause stomach ulcers in a 10-pound dog. While Thai Ridgebacks require little grooming there are important things that must be done on a regular basis. It is important to get you puppy used to being handled and groomed from the beginning. Short haired dogs such as the Thai Ridgeback need only to be bathed twice a year or when required. If you are showing your dog you will be bathing more often therefore it is important to use a good quality shampoo and conditioner on the coat. Do not use human shampoo as it is too acid for a dogs coat and may irritate the skin. Click Here For More Ear Care Info. Care of the teeth must also be done on a regular basis. You can purchase kits for brushing your dogs teeth. There are also biscuits that help with tartar control. Tartar can cause inflamed gums, and a loss of appetite if severe. If care is not taken you may need to have the vet remove the tartar from the teeth. If your dog has bad breath and brushing is not helping, try giving charcoal biscuits. Bad breath can be caused by an upset in the stomach and the biscuits will help settle it. If the problem persists visit your vet. Adults have 42 teeth while puppies have 32. Click here for more teeth care info. Housebreaking is not difficult but it does require time and patience. Frequent and regular trips outside are the key, especially after eating, drinking, playing and waking from sleep. As soon as you take your puppy out put them in the spot you would like them to do their duty, as soon as they do it praise the puppy by talking and petting. Do not play with your puppy outside until they have done their duty. They will then learn to do it as soon as they go outside.